I'm sorry but the atheist will accept evidence for god. Just have to define what evidence means. Evidence is not one's feelings. "I believe god exists because when i do i feel good" well i don't believe in god and i feel good too. "I believe god exists because there is nature around me" However we have science to explain how nature exists without needing a god. Believers think god has always been here. And energy can never be created or destroyed. So when electrons move around and form elements they eventually form nature. "I believe god exists because he talks to me" and some people who say that get committed and some don't what is the dividing line? Frankly we just dont have a way YET to measure the SUPER(more than) NATURAL. Which is one reason we dont use it in a court of law. Xan you imagine all the people saying god told me you committed the crime? Evidence has to be able to be measured. Evidence has to be able to be reproduced by other people and get the same results. If you have that for god many people would love to see/hear/read/ replicate the tests for it. Thanks Marcia. I actually agree with you that an atheist will accept evidence for a god. I know many atheists who have, and are no longer atheists. Regarding your comments evidence "has to be able to be measured,'' I think I understand what you meant by that. You meant that in order to know something for certain, it must be through empiricism alone, right? And not with any metaphysical pre-commitments, right? This post is very confusing. My understanding of circular reasoning ia that it ia akin to using a word to define itself. So if you say your mother is a spy. And i say how do you know? And you sau because spies are mothers. You haven't told me HOW YOUR KNOW YOUR MOTHER IS ONE. IF i say what IS a spy? And you say one who does Spy things YOU HAVENT TOLD ME ANYTHING and we will go around in circles. Every time I use the term "fallacy," I mean it as an informal or formal syllogism which presents an invalid argument. 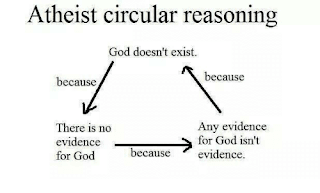 Circular reasoning is the fallacy of Begging the Question, where one assumes the validity or existence of a thing within the premises of one's argument, in order to reach a conclusion about the validity or existence of that thing. Thanks to whomever typed 2 hours of transcription. I was stopped very early in this debate. The crackers in the pantry fallacy. The Christian states that ffinding out whether there are crackers in the closet is different than how you find out many other things and he lists all kinds of aciences. But that's not true. You examine the closet to find out whether the crackers are there. You also EXAMINE the air to determine bariatric pressure. Perhaps the cracker only needs one exam whereas bariatric pressure may need more exams but it is STILL EXAMINATION and testing. begging the question or circular reasoning." Pretended Neutrality fallacy. One can see this by considering the following quotation from Dr.
statement which claims to be factual." This also doesn't make sense. There's logic and there's illogic there's order in thinking and there s disorder in thinking, there's knowledge through your senses and there's knowledge without your senses? which i don't know how you measure, but i think believers count this as knowledge but atheists don't. So the spiritualist/medium can not close her eyes and say she's talking to dead people and we would believe it. So the way you prove that logic is the best way to solve a problem or determine something is factual is try tbe opposite. Try yo prove something is factual illogically or chaotically or disorderedly. Even if you get results you woukdnt know how you did it. All we habe are our brains and senses to input information into our brains. Thay is our reasoning our logic that is all we can use because that is what we can measure. Example: (I'm not an expert but my inderstanding is) a gun sight needs you to close one eye. So the gin maker takes into account that our two eyes have a focus that our one eye does not. So in the experiment of a machine that can shoot a projectile an hit a target we can measure for the fallibility od our eyesight. There is no way to do that with god. We label the thing we think with a brain, and the thinking logic. So the question is not circular it it's just the labels we use. Again, it sounds like you are committed to the belief that pure reason apart from sense experience cannot itself provide us with factual knowledge. Or, another way of saying the same thing is, that all informative or factual statements about the objective world must be derived empirically (based on experience, observation, sensation), and therefore human knowledge cannot transcend particular, physical experience or the appearance of the senses. Is that an accurate portrayal of what you believe? Honest question. 2+2=4. 4-2=2. The way Dr Stein proves his logic/reasoning is by falsifying it. Or in other words seeing if the opposite or negative is true. Or trying to prove it is false. If you put out water, and you think the dog drank it. You now test in some manner that it was not anyone else like the cat. If the cat can be a possibility then you need another test? If the cat was locked up all day then it was the dog. I listened to your appearance on Dogma Debate. I must say I shared in David's frustration at your evasiveness. On this particular issue I think you said, or at least alluded to, two contradictory assertions. At one point you said that you presuppose that your god is good. And therefore, when you read about him doing horrible things, like killing children to prove a point, you assume he has a good reason to do it. 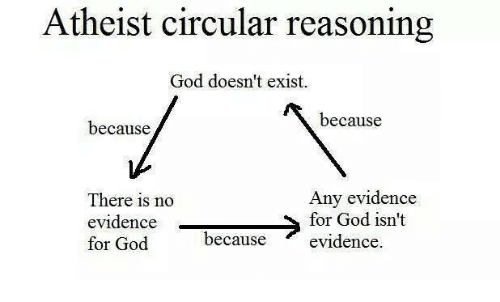 The other thing you said was that circular reasoning is not always fallacious. You then tried to explain why it is not always fallacious. I think in the first instance, where you presuppose something, it is not circular. So if you presuppose that your god exists, or that he is good or just, then you are not trying to justify your assertion. This is not circular. but if you try to justify your presupposition, it becomes circular. I've heard many metaphysical justifications for the principles of logic. But you could simply presuppose the principles of logic in which case it is similarly not circular. Presupposing a god to explain logic seems unnecessary and problematic in many ways. Where is the evidence for GOD? Apparently you didn't click the links (highlighted in blue) at the end of this article. Is that what you guys got ? I just shared the transcript for a laugh to a few people. What a load of horseshit. It was bleak piece just prasing God and forcing the reader to believe, seen many of these. God had to make Shakespeare a better writer than him and if god answers your prayers, he increases your faith. If he delays , he is increasing your patience. If he doesn't answer he has something better for you. You people are a joke for fooling yourselves for centuries and even in 2019 ffs. Religion the root of all evil is dying and will be dead in 150 years. Earth deserves some peace. It seems to me that you actually didn’t carefully read the transcript I linked to above. What did you think about Gordon Stein’s justification for the existence of universal, abstract, invariant laws—such as the laws of logic?